How does a 2nd-generation Ryzen 5 2600 CPU at 3.40 GHz on a recent X470 motherboard compare to an older Intel i7-4770 at 3.40GHz? Does the six-core AMD Ryzen 5 2600 blow the Intel i7-4770 out of the swimming pool like a tubby chubby doing a cannonball? Or does it leave mere ripples in the shallow end of the kiddie pool like a cautious granny? Having an opportunity to use both processors, I performed a few kind-of-real-world tests of my own to compare them while keeping most other factors equivalent. Two separate systems were used. Both running Linux Mint 18.3 64-bit on NVMe SSDs to ensure that the storage would not be a bottleneck. No overclocking of any kind was used. Both processors and systems ran at their default settings. This is 3.40 GHz versus 3.40 GHz for the CPU clock. A 25.6GB file of random data was generated and copied to the NVMe of both systems. This file would be the test file used. md5sum – Generate an MD5 hash of the file. 48G – md5sum of a large 48GB file containing random binary garbage. HardInfo – Use HardInfo’s benchmarking tests to compare performance. The md5sum and zip tests were performed in a terminal using Bash. For the the x5 zip test, five separate terminals were used in each system. The real result was recorded from the time output. Both md5sum and zip are provided by default in Linux Mint. Hmm. Not as great as expected. This particular i7-4770 is five years old (2013), and it still holds up well compared the newer Ryzen 5 2600. The Ryzen 5 is slightly faster by about a second to a few seconds given the same task. The surprise was in the x5 zip test. The quad-core i7-4770 actually beat the modern six-core Ryzen 5 2600 by almost one minute. To see if more cores on the six-core Ryzen 5 would perform better than the four cores available on the i7-4770. For some reason, having six cores was not an advantage even though it would seem to be. Even more, this i7-4770 is five years old! Keep in mind that each zip test was performed using Bash in its own terminal, and the terminals are single-core each. 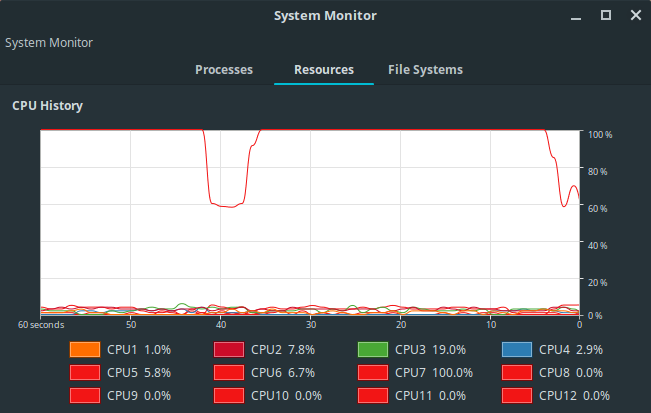 System Monitor was running on each system during all tests to observe CPU activity. One terminal per core, but the cores would swap the terminals around. In other words, a terminal would not complete entirely on the same core. AMD Ryzen 5 2600 @ 3.40 GHz. Hex-core. Five simultaneous zips, each in a separate terminal. The same 25.6GB file was used for all. Here, there are five cores at 100%. Intel i7-4770 @ 3.40 GHz. Quad-core. Four cores performed better during the same compress-by-five test on the same 25.6GB file. 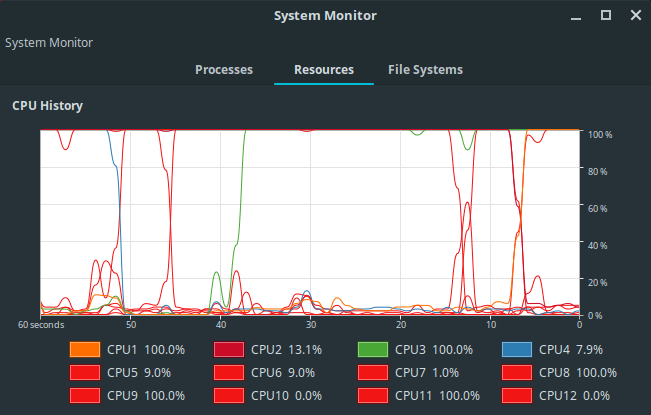 Four cores are at 100%, one for each terminal. The cores would swap the 100% reading around to different cores. Ryzen 5 2600. 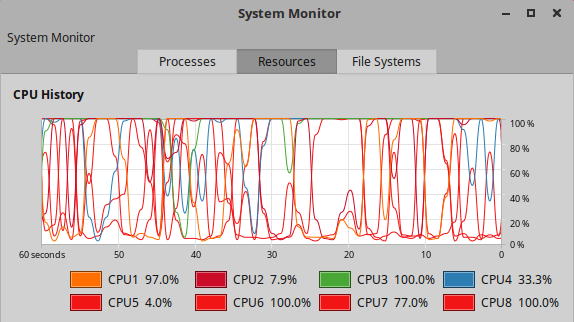 Despite having six cores, only one was active at 100% at a time when compressing the 25.6GB file of random data. Shown here is the single zip test. HardInfo is available for free from the Ubuntu repository. Use Synaptic or the terminal to install it. Thinking of buying a new processor? You can benchmark your current system using HardInfo and compare the results with these numbers to see if upgrading to a Ryzen 5 2600 would make a difference. (*) Higher is better for this test, Lower is better for all others. Note: HardInfo reported the CPU clock speed as 1550 MHz for all tests on the Ryzen 2 2600 processor. The tests were performed with all default settings. No BIOS tweaks or overclocking. Either the CPU was running at a slower speed or HardInfo was incorrectly reporting the CPU clock. The i7-4770 reported the full 3400 MHz (3.40GHz), so maybe there was an issue somewhere. BIOS reported the CPU clock speed as 3400 MHz while HardInfo and /proc/cpuinfo reported 1550 MHz. Yes, I was puzzled. cat /proc/cpuinfo | grep "MHz"
In Linux Mint 18.3, 1550 MHz is returned for all cores on the Ryzen 5 2600 even though this is a 3400 MHz (3.4 GHz) processor. The i7-4770 did not exhibit this issue. Linux numbers matched the BIOS numbers. Maybe the kernel was problematic? After all, the Ryzen’s Linux Mint installation used kernel 4.10.0. After upgrading to 4.14.8 and 4.16.17 (the latest as of the time of this writing), Linux still reported the CPU running at 1550 MHz. After researching online, it turns out that there is a fix. This is not a bug, but rather a “feature” on the motherboard. The solution is to disable PSS Support. This option is usually found under Advanced > CPU Support > PSS…then set to Disabled. It was set to Enabled by default. After I disabled it and rebooted into Linux, HardInfo and /proc/cpuinfo both reported the correct 3400 MHz CPU clock. PSS Support disabled in BIOS. /proc/cpuinfo now reports 3393.551 MHz, which is close enough to the advertised 3.4 GHz speed of the Ryzen 5 2600. Hmm. Nothing spectacular. Still not quite certain if the speed is showing through to the tests or not. I would think that newly-reported CPU speed would produce lower times, but there is hardly any difference. HardInfo showed slight improvements in some benchmarks. The Ryzen 5 2600 at 3.40 GHz beats the Intel i7-4770 at 1550 MHz and 3.40 GHz, but not by much. At first glance, I was expecting a modern six-core processor to thoroughly dominate and overpower a five-year-old quad-core CPU at the same clock speed (3.40 GHz), but this was not the case. However, HardInfo reported a much lower CPU clock for the Ryzen 5 2600 than for the i7-4770. If this was true and the Ryzen was indeed running at a slower clock speed, then that would explain the performance comparable to the i7-4770. Despite disabling PSS in BIOS and updating the Linux kernel, results tended to be even worse at the reported 3.4 GHz. Not sure what is going on. But that was not the focus of this test. The purpose was to compare the two processors at their new-install defaults without delving into BIOS or clock speeds. What would the Ryzen 5 2600 do when turned on from the start? Regardless, if the Ryzen was running at 1550 MHz, then it shows how efficient it is by slightly outperforming the i7-4770 at less than half the clock speed. If building a new computer today, I would definitely choose the Ryzen 5 over the i7-4770 simply for the power factor alone. The Ryzen 5 2600 is a 65W CPU while the i7-4770 is an 84W CPU. This means a less elaborate cooling system is needed, and it draws less electricity under full load. While these tests did not elicit the “wow” I was expecting, they did show what to expect during my everyday usage. Other programs optimized for multi-threading might see a bigger advantage. But the most important fact is that the Ryzen 5 2600 works perfectly with Linux. Yes! This entry was posted on June 21, 2018, 11:44 PM and is filed under linux. You can follow any responses to this entry through RSS 2.0. You can leave a response, or trackback from your own site.